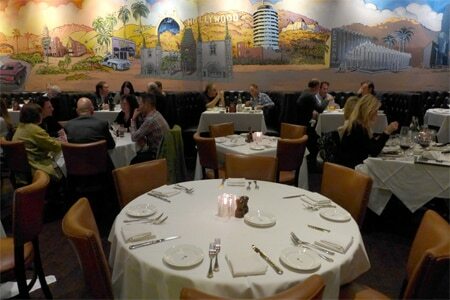 The Palm steakhouse has brought a branch to Beverly Hills. : Having closed its original West Coast location in West Hollywood that opened back in 1975, The Palm went on to open a new branch of the steakhouse in Beverly Hills. A 90210 address always adds prestige, not that the iconic restaurant needed it. Expect similar décor with celebrity mug shots adorning the walls. A vast room with an authentic vintage wood ceiling brings warmth to the bustling eatery. Two private rooms might give you some isolation, and the bar will help you connect with your dining peers. Just as with the environs, you'll recognize the menu that’s also offered at the twenty other outposts. A unique selection here is The Natural, a market-oriented hormone-free cut. Do not pass up the lobster; did you know The Palm has its own farm to produce the crustaceans in ample and consistent supply? Gwyneth Paltrow and Larry King have already been there, what are you waiting for?